Late-night television has never been a bastion of diversity. Since The Tonight Show defined the genre 60 years ago, it has always been exceedingly white and male. Let’s take a roll call: Allen, Parr, Carson, Leno, Letterman, Conan, Fallon, Kilborn, Ferguson, Stewart, Colbert, Maher, Kimmel, Meyers, Oliver. That’s a lot of white dudes. Over the years, there have been some attempts at diversity — Arsenio Hall, Joan Rivers, Chelsea Handler, W. Kamau Bell — but that’s a short list by comparison. Not to mention all these efforts were short-lived or shunted to basic cable. Fox canceled Rivers’ 1989 talk show before it ever found its legs keeping women pretty much out of late night until Handler’s Chelsea Lately appeared on E! in 2007. While Handler has enjoyed some success on E!, she recently announced she will be leaving for a new talk show project on Netflix that will debut in 2016. In April, comedian and YouTube star Grace Helbig will debut her own show on E!, keeping a woman in the late-night mix, but decidedly out of the network mainstream. Meanwhile, Bell’s Totally Biased foundered in basic cable limbo on FX for 72 episodes between 2012 and 2013 before it was unceremoniously canceled. Enter Larry Wilmore, the former Daily Show correspondent and new host of The Nightly Show, which debuted last month on Comedy Central in the 11:30 p.m. timeslot formerly held by The Colbert Report. As The Daily Show‘s senior black correspondent — a tongue-in-cheek title that winked at journalistic tokenism, as well as knocks against the show’s own lack of diversity — Wilmore offered up humorous yet honest perspectives on issues of race and the African-American experience. Recent episodes have covered the vaccines, obesity, American Sniper, black fatherhood, and gay marriage. While the topics have been meaty, the discourse has tended to be slight. Part of problem is that Wilmore and company is still working things out. No talk show nails it right out of the box. Finding the right rhythm and tone can take time. Hopefully, Comedy Central will give Wilmore time here. The panel discussion is the segment, which is positioned as the centerpiece of the show, is still shaky. Moderating a discussion on a controversial issue between four strong-minded individuals is no easy task. It’s evident Wilmore is still learning how to wrangle debate. Some discussions have meandered or danced around an issue without managing to deliver anything particularly interesting or insightful. As moderator, it’s Wilmore’s job to keep the conversation on track and steer it into deeper, more challenging waters. Along the way, it wouldn’t hurt if Wilmore peppered in more jokes. As a comedian, Wilmore is funny, but not as nimble an improviser as Stewart or Colbert. As such, episodes have felt a little stiff; falling show of being beat for beat as funny as The Daily Show, and miles away from the arch humor of Colbert. Both Stewart and Colbert proved that late-night programming doesn’t have to be mindless drivel, but they also knew how to balance the serious with the silly. Given the heavy topics discussed on The Nightly Show, it’s hard to know if viewers are going to want to keep tuning in without more consistent laughs. That’s not to say the show isn’t funny — it is! — it’s just that the ratios need a bit more tweaking. Fortunately, Wilmore is showing signs of improvement. The first week was expectedly rocky, but the topics — black protest, Bill Cosby, the State of the Union, US-Cuba relations — may have been a bit heftier than should have been attempted out of the gate. Subsequently, Wilmore has gotten more at ease in the driver’s seat. A recent episode on obesity included a thoughtful discussion that pushed beyond the beats of typical media debate on the subject. But for all these hot-button issues, The Nightly Show still feels safe. Compared to his former Daily Show colleague John Oliver, whose Last Week Tonight news show premiered on HBO last spring, Wilmore is more restrained. Oliver’s marriage of in-depth coverage of overlooked issues and withering humor has quickly made him a force in the world of satirical news. Wilmore is every bit as talented and clever as Oliver. His Daily Show segments prove that he can do trenchant, biting commentary. As he gets more comfortable behind his own desk, I hope he will cut loose and push the show into more daring waters. Stewart and Colbert have proven humor is a dangerous, powerful weapon that can penetrate and sear as it gets to the deeper truth. With the departure of Colbert and now Stewart’s own retirement slated for sometime this year, the satirical vacuum is growing. Its incumbent upon Oliver, Wilmore, and whomever takes over at The Daily Show (preferably one of the many very funny, capable women comics out there) to keep making us laugh and think — and, hopefully, add some fresh perspectives to late night. 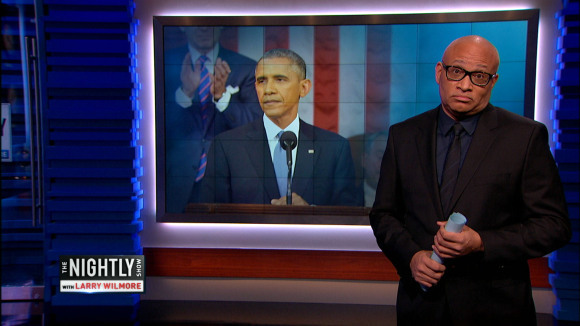 The Nightly Show airs Monday-Thursdays at 11:30 p.m. on Comedy Central.